Taipei, February 19, 2009 -- Since the consumer demand freeze caused by the global economic downturn and the financial crisis in 2H08, the DRAM quarterly average spot and contract prices both dropped over 40% QoQ. According to the new survey statistics done by DRAMeXchange, the WW DRAM revenue of Q408 also declined 40% QoQ. In Q408, the DDR2 667Mhz 1Gb chip price dropped from 12.5 USD at the beginning of October to its low 0.58 USD in mid December, with a 54% dropping range. In the contract market, the DDR2 1GB module price dropped from 13.5 USD in early October to 8 USD, the degree of dropping reached 40%. Besides, after DRAM vendors cut their capacities from September, the Q4 WW DRAM wafer started declining to only 1.2 million wafers, decreased 20% while comparing to Q3. On the foreign exchange side, the depreciation of Korean won and appreciation of Japanese yen also affected the calculation of DRAM revenue drop. All these factors had influenced the Q4 DRAM vendor revenues. DRAMeXchange has compiled 2 WW DRAM vendor ranking tables. The main table “Figure 1.” is the revenue ranking by DRAM vendor own brand (remark 1). The second table “Figure 2.” is based on the fab manufacturing basis (remark 2). 1. 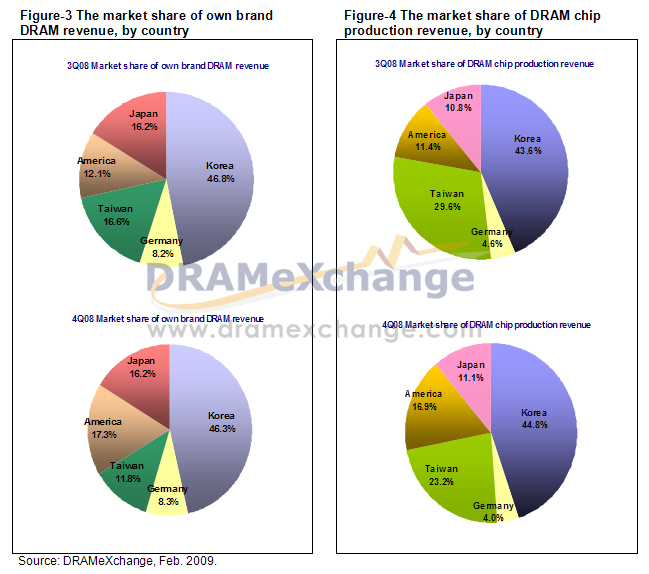 Analyzing the own brand memory revenue of DRAM vendors, Korean maker Samsung was still at first position. But under the influence of an almost 40% contract price drop, the Samsung Q4 revenue declined 43.1% (Korean won depreciated 28% QoQ in Q4, the Samsung Q4 DRAM revenue only decreased 25% in terms of Korean won). The Q4 Hynix revenue declined 38.6% in terms of USD (18% decline in terms of Korean won). The Micron fiscal quarter was September, October, and November therefore its chip average price was higher than other vendors and the Q4 revenue drop was far less than other DRAM vendors. Its market share increased from 16.9% of Q3 to 11.7% of Q4. In Q4, Qimonda still accounted for 8% WW DRAM market share, but Qimonda announced filing bankruptcy protection in January 23rd, at the same time, it also stopped its OEM relationships with Inotera and Winbond, and closed its U.S. fabs. The DRAM market share will sharply decline in Q109. * In Figure 1, the Samsung Q4 revenue was based on its total semiconductor revenue, excluding LSI revenue (LSI = Large Scale Integration) which had been announced in its analyst meeting, its 57% DRAM revenue portion, and its Q4 average foreign exchange rate (1 USD against 1363 Korean won). The same method was also applied to Hynix and based on 76% DRAM revenue basis. Micron revenue was based on 49% DRAM. PSC 40%, Promos 80%, Nanya Technology 90%, and Winbond 39% (with the average foreign exchange rate of 1 USD against 32.99 NTD). Elpida was with the average foreign exchange rate of 1 USD against 96.07 JPY, and Qimonda with the average foreign exchange rate of 1 USD against 03757 Euro. * In Figure 2, Hynix deducted 1.5% of its Q4 revenue contributed by the Promos portion. Elpida deducted its revenue contributed by Rexchip and PSC, which added up about 26.5%. Qimonda deducted its revenue contributed by Inotera and Promos, which added up 50.5%. Remark 1: The revenue in the table is using the results which were announced by the DRAM vendors and deduct the non-DRAM business revenue, then converted the number into USD basis with the average Q4 foreign exchange rate. This table is based on the vendor brand revenue basis, and the vendor’s sub-manufacturing revenue is excluded. For example, the revenue portion which was from PSC’s sub-manufacturing for Elpida is excluded from the PSC revenue here in this table, and the same applies to the Hynix portion of Promos and Qimonda portions of Inotera and Winbond. Remark 2: The revenue is calculated and ranked by the total chip production revenue of the vendor’s fabs. Thus the revenues of pure manufacturing vendors such as Rexchip and Inotera were independently listed. The Promos portion is excluded from the revenue of Hynix, the PSC and Rexchip portions are excluded from the revenue of Elpida, the Inotera and Winbond portions are excluded from the revenue of Qimonda, the Inotera portion is excluded from the revenue of Nanya Technology, and the Rexchip portion is excluded from the revenue of PSC. The reason we post the second table is because of the increasing outsourcing percentage of the current international DRAM vendors. The changes of Taiwanese vendors in the competition and integration this time will influence the future revenue ranking and market share of the DRAM vendors.